I'm so sad that I can't go to this, but for all my neighborhoodies reading, tonight is the Boerum Hill Association's first annual Boerum Hill Pub Walk. Modeled after "Original London" Pub Walks, this pub walk will follow a trail highlighting Boerum Hill's role in history, from key revolutionary war battles to the home of Mohawk Indian steelworkers, all centered around short pit stops at 3 history-laden local pubs along the route - the Brazen Head, the Brooklyn Inn, and Hanks Saloon. Tickets are a mere $10, but do not include drinks (some pubs have promised you all special discounts.) Walk begins at 7:30 PM sharp, and is limited to 20 participants. Meet outside Trader Joe's at SW corner of Court & Atlantic. 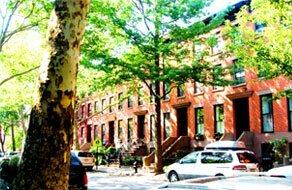 These Pub Walks are going to be a fun way to discover (or rediscover) Boerum Hill as a small group taking a relaxed walk. If there's strong interest we can always add more dates to accommodate more people. And for later in the year, we're planning a second Pub Walk to focus on the history of haunted spots in the neighborhood. If nothing else, it'll be a great way to meet neighbors and soak up the amazing history of our little part of Brooklyn." So anyway, so sad I can't go, but next time I'm in!